Manufacturing. Work out how long it takes to make that nifty new sword and how much it costs – and learn secrets that would make it better! 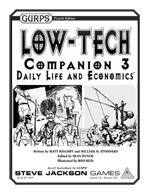 See GURPS Low-Tech Companion 1: Philosophers and Kings for information on the social tools that made day-to-day life possible, including information on medicine, mathematics, and music. 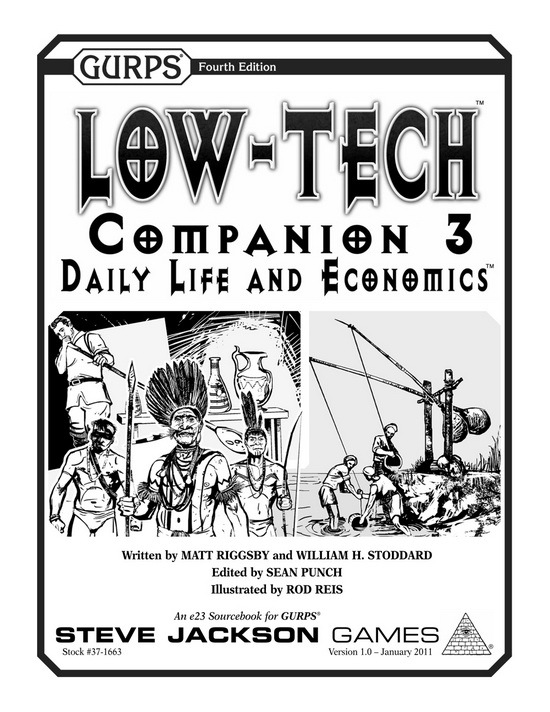 GURPS Low-Tech Companion 2: Weapons and Warriors gives more details on the gear and social structures necessary to keep citizens safe. When a toiling populace daydreams, its thoughts can turn to gear, equipment, and achievements that are (as far as we know) impossible. See GURPS Fantasy-Tech 1: The Edge of Reality for more possibilities of what could have been. For additional material that builds off the foundation of this supplement, check out Pyramid #3/33: Low-Tech and Pyramid #3/52: Low-Tech II. For additional information on historical "thieves' guilds" (or lack thereof), check out Pyramid #3/47: The Rogue's Life.